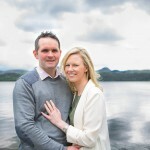 In May I met up with Mags and David for their pre wedding shoot. We started off at their wedding venue,‘PARKES CASTLE ‘ which holds happy memories for the couple, as this was the place that David Popped the question! I’m Looking forward to their big day in June.